This data set contains two data files in text format (.txt). One file provides net primary production (NPP) data for a lower montane rainforest and the second file provides climate data. The NPP studies were conducted at Marafunga (6.00 S, 145.18 E) in the highlands of Papua New Guinea to the east of Mount Kerigomna, about 25 km west of the town of Goroka. Leaf area index (LAI), litterfall, litter standing crop and decomposition, and nutrient content of different vegetation components were measured from November 1970 through December 1971 at four representative forest stands: Ridge Top; Ridge Gap; Valley; and Slope. Forest inventories and field measurements of above- and below-ground biomass were made by destructive harvest at a fifth stand (Ridge Top) during October-December 1970 and April-August 1971. The results of these studies are given for the forest at large. The only component of NPP determined at Marafunga was litterfall (755 g/m2/year). The climate data in this data set are available from a weather station at the Marafunga sawmill, about 2.5 km from the Marafunga study sites, and from a weather station in a clearing in the primary forest. A rainfall record for the period 1969-1971 was made daily at the sawmill. Records of maximum and minimum temperatures were made every two weeks for the period December 1970-August 1971 at litter level at the four nondestructive study sites. Revision Notes: Only the documentation for this data set has been modified. The data files have been checked for accuracy and are identical to those originally published in 1999. Figure 1. Profile of the tropical montane forest at the Marafunga study site, Papua New Guinea, immediately west of one of the plots clear-felled for the determination of biomass. The tallest trees are podocarps. Note also the prominent pandans and occasional patches of scrambling bamboo. (Photograph taken 1970-71 by Dr. P.J. Edwards, Federal Institute of Technology, Zurich, Switzerland. Reproduced by kind permission of the Journal of Ecology and the British Ecological Society). The NPP data collection contains field measurements of biomass, estimated NPP, and climate data for terrestrial grassland, tropical forest, boreal forest, and tundra sites worldwide. Data were compiled from the published literature for intensively studied and well-documented individual field sites and from a number of previously compiled multi-site, multi-biome data sets of georeferenced NPP estimates. The principal compilation effort (Olson et al., 2001) was sponsored by the NASA Terrestrial Ecology Program. For more information, please visit the NPP web site at http://daac.ornl.gov/NPP/npp_home.html. Edwards, P.J., and P.J. Grubb. 2013. NPP Tropical Forest: Marafunga, Papua New Guinea, 1970-1971, R1. Data set. Available on-line [http://daac.ornl.gov] from Oak Ridge National Laboratory Distributed Active Archive Center, Oak Ridge, Tennessee, USA. doi:10.3334/ORNLDAAC/478. Edwards, P.J., and P.J. Grubb. 1999. 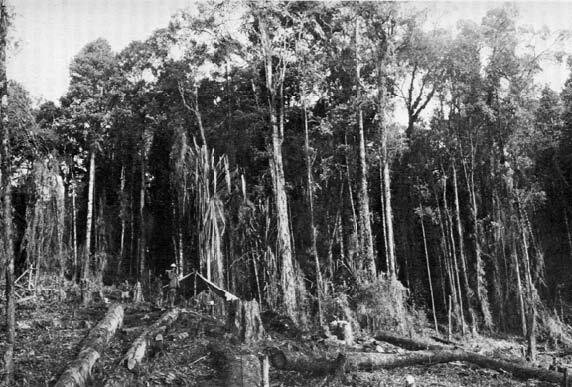 NPP Tropical Forest: Marafunga, Papua New Guinea, 1970-1971. Data set. Available on-line [http://daac.ornl.gov] from Oak Ridge National Laboratory Distributed Active Archive Center, Oak Ridge, Tennessee, U.S.A. This data set contains two data files (.txt format). One file provides NPP component data (above- and below-ground biomass, leaf area index (LAI), litterfall, litter on the forest floor, and bioelement concentrations) for a lower montane rainforest at Marafunga in the highlands of Papua New Guinea for the period 1970-1971. The second file provides precipitation and temperature data from a weather station at the Marafunga sawmill, about 2.5 km from the Marafunga study sites, and from another weather station in a clearing in the primary forest. The net primary productivity measurement presented here is based on total annual litterfall, giving a minimum estimate of above-ground NPP (755 g/m2/year). Annual rainfall at the Marafunga sawmill over the 1969-1970 period was about 3,635 mm (as reported in this data set; 4,010 mm cited in the literature from other sources), with the heaviest rains falling between October and April and several dry spells of 14-21 days occurring during the period May-August. During this time, the forest floor on ridge tops and slopes becomes dry. Ground fog is notably absent, unlike many montane rainforests. The Marafunga forest was also unusually tall for its elevation, at least partly as a result of the high soil fertility in the area (high phosphorus, moderate pH, deep profile). The only likely sources of long-term climate data are the stations at Goroka and Mount Wilhelm, but climate varies markedly across this mountainous region and such data may be unrepresentative of the study site (Edwards, personal communication). ANPP, BNPP, and TNPP values reported in Esser (2013), Olson et al. (2013a, b), and Clark et al. (2012a, 2013) differ from values presented herein due to different calculation methods (Table 1). The differences in NPP values reported in this table are mainly due to differences in calculation methods, as explained in these notes. Please consult original references for details. Revised data sets (R1, R2, etc) are accompanied by ORNL DAAC Data Set Change Information files. Please see the corresponding documentation for reasons why the data values were revised. 1For this table, NPP data from the original data source were converted from grams of dry weight per meter square per year to grams of carbon per meter square per year using a conversion factor of 0.5. The ANPP estimate is based on field measurement of total litterfall accumulation, giving a minimum estimate of NPP. 3Clark et al. (2001a) used a different approach to calculate net primary production values. ANPP was calculated by summing reported above-ground biomass increment + reported fine litterfall + estimated losses to consumers + estimated VOC emissions. BNPP was calculated by summing 0.2 x estimated ANPP for a low BNPP estimate + 1.2 x estimated ANPP for a high BNPP estimate. TNPP was calculated as the range between the low and high values of ANPP + BNPP. Average BNPP and TNPP estimates were also calculated. See Clark et al. (2001a) for a discussion of calculation methods, including how unmeasured components of ANPP were estimated and the basis for setting bounds on BNPP. 4Based on litterfall and branch fall, average of 4 sites. Forest inventory and destructive above- and below-ground biomass measurements were made at the Destructive Harvest Ridge Top site on a 20 x 20-m plot. Forest inventory, nondestructive biomass measurements, and mineral nutrient cycling studies were made at three additional sites (nondestructive Ridge Top, Valley, and Slope) on 20 x 10-m plots. Litterfall was collected at four 20 x 10-m sites [nondestructive Ridge Top, Ridge Gap, Valley, and Slope] using 1 x 1-m litter traps stratified on a random basis on each site (two traps within each of eight 5-m2 quadrats per site). Litter on the forest floor was measured at the four nondestructive sites using metal rings 25-cm in diameter (area = 0.049 m2 ). Litter decomposition was measured at the Ridge Top (nondestructive) and Valley sites using stretchy, plastic mesh bags with ~8-mm openings when fully expanded, but usually more closed up. Bioelement concentrations were analyzed from nineteen organic fractions from the Destructive Harvest Ridge Top plot (20 x 20-m); about 2,300 analyses were carried out. The results from these study sites are given in this data set for the forest as a whole. Forest inventory and biomass measurements were made in October-December 1970 and April-August 1971. Litterfall was collected for 12 months (December 7, 1970 to December 6, 1971). Litter on the forest floor was collected between November 1970 and August 1971. Litter decomposition was measured using litter bag placed on the litter in the forest on January 13, 1971 and sampled after 131, 188, and 325 days. Climate data are available from January 1969 through June 1971. A rainfall record for the period 1969-1971 was made daily by the staff of the Marafunga sawmill using a gauge on a post. Records of maximum and minimum temperatures were made by Edwards (1973) for the period December 1970-August 1971 at litter level for four sites in the primary forest with readings taken every two weeks. Biomass measurements were made one time. Litterfall was collected every 4 weeks from December 1970 until August 1971, and thereafter at intervals of 8 weeks until December 1971. Litter on the forest floor was collected on three occasions: November 26, 1970; March 20, 1971; and August 15, 1971. Litter decomposition was measured in litter bags on three occasions: March 26, 1971; July 21, 1971; and December 17, 1971. Above- and below-ground biomass and bioelement concentration estimates are expressed as g/m2 (dry matter weight), measured at one site but estimated for the forest at large. Litterfall estimates are based on plant dry matter accumulation, expressed as g/m2/year, mean of the nondestructive four sites. Litterfall for individual sites is reported in Edwards (1977). LAI data are reported as m2/m2, extrapolated for the forest at large from measurements at the destructive site. Litter decomposition constant (k) is dimensionless. Climate data are expressed as monthly and annual precipitation amounts (mm) and monthly absolute maximum/minimum temperature (C). NPP Data. NPP estimates for the Marafunga site are provided in one file (Table 2). The data are in .txt format. The variable values are delimited by semicolons. The first 18 lines are metadata; data records begin on line 19. The value -999.9 is used to denote missing values. 3Based on the assumption that leaves comprise 25% of the biomass of the 0-1 m understory layer (including epiphytes). 4Based on assumption that the root:shoot ratio (1:8.0) is similar in different species and does not change appreciably with increasing tree size. See discussion in Edwards and Grubb (1977). 6Ratio of the annual litterfall amount (mean of four sites) to total standing crop of litter on the ground (mean of four sites). 7Based on sum of leaf biomass from trees of gbh > 30 cm, trees of gbh < 30 cm but > 4 m tall, saplings and shrubs, seedlings, pandans and tree-ferns, and climbers and tall scramblers. Climate Data. The climate data are in text format (.txt). The first 18 lines are metadata; data records begin on line 19. The variable values are delimited by semicolons. The value -999.9 is used to denote missing values. Notes: Data were read from graphs. tmax and tmin are ABSOLUTE, not mean, values measured on the forest floor. 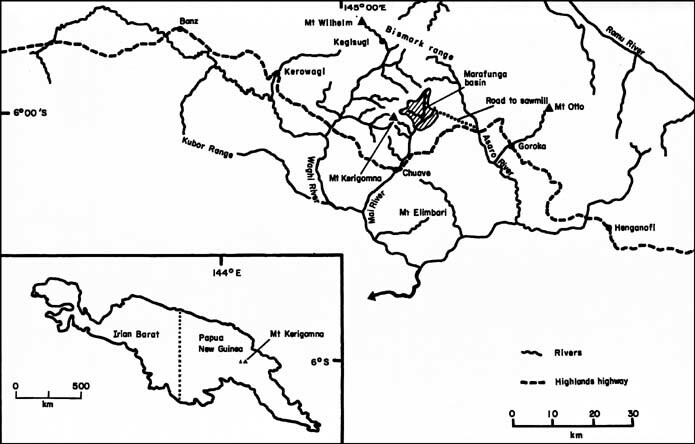 Annual precipitation data for 1969 and 1970 from the Marafunga sawmill do not correspond with the value mentioned in references (4,010 mm). The accumulation of biomass, or NPP, is the net gain of carbon by photosynthesis that remains after plant respiration. The NPP measurement presented here is based on total annual litterfall, giving a minimum estimate of above-ground NPP. The objective of the forest inventory and biomass study was to increase scientific understanding of the factors that determine the distribution of forest types on wet tropical mountains and of the adaptations of the plants growing in these forests. Additional studies (i.e., estimates of the nutrient and organic matter content of various fractions of the vegetation, amount of litterfall, and rate of litter decay) were undertaken to provide the necessary background for a study on the rates of nutrient cycling in a lower montane rainforest. The tropical forest biomass data for the Marafunga site are provided for comparison with models and estimation of NPP. Climate data are provided for use in driving ecosystem/NPP models. Biomass estimates compare favorably with values published for other tropical rainforests (Table 8, Edwards and Grubb, 1977). Each of the cited references for Marafunga studies include discussions of data quality. A major weakness of the results of this study is that they cover only one year. Additionally, the biomass estimate for roots is the least satisfactory part of the derived values for the forest at large. The bird-shaped island of New Guinea (including West Irian and Papua New Guinea) has a mountainous spine running from one end to the other, with detached ranges. The study site is located to the east of Mount Kerigomna (3,670 m) in the Bismarck Range, in a small basin (4 x 3.5-km) drained by the River Fatima and locally referred to as Marafunga (latitude 6.00 S, longitude 145.18 E). The study site is just above the altitudinal limit for traditional agriculture, apparently in a "no-man's land" between three tribal areas. Most of the forest was untouched until 1963-64, when extraction of timber began on a large scale. Very little primary lower montane rainforest was left in the basin at the time of this study. Figure 2. Map showing location of the Marafunga tropical forest study site, Papua New Guinea. (Reproduced by kind permission of the Journal of Ecology and the British Ecological Society). The study area is made up of relatively broad ridges, slopes of 10-45 degrees, and valleys. There is no obvious, consistent structural or floristic differences between the various topographic situations. Most of the data in this data set come from four representative forest stands: Ridge Top; Ridge Gap; Valley; and Slope. A fifth stand (Destructive Harvest Ridge Top) was used for biomass harvests. Stevens and Grubb (1977) and Grubb and Edwards (1985) give a detailed account of the vegetation, which is very rich in species for the forest's altitude. They reported a total of 119 tree species, 32 shrubs, 37 herbs, 44 climbers and scramblers, and 116 epiphytes. The principal families of angiosperm trees are the Cunoniaceae, Elaeocarpaceae and Lauraceae. The two conifers Dacrycarpus cinctus and Podocarpus archboldii are abundant and are the most important trees economically. On a world scale, the Marafunga forest is tall (27-33 m) for its elevation (2,500 m), with the conifers and occasionally certain angiosperms emerging to 37 m. Of the tall trees, most reached a maximum girth at breast height (gbh) of ~2.0 m, but some, notably the conifers, regularly attain a gbh of 3.0-3.5 m, occasionally 4.0 m. Many have buttresses up to 0.5 m high. Tree pandans growing to 20-24 m are a notable feature; they have prominent prop-roots. The canopy of the mature forest was almost completely closed, although it was not usually dense, nor was it particularly dark at ground level. Beneath the taller trees there are many species of smaller trees and shrubs, as well as saplings and seedlings of some of the taller trees. Tree-ferns (mostly Cyathea spp.) are common, but rarely grow more than 4-6 m high. Ridge Top -- Altitude 2,480 m. Mostly flat on the top of a broad ridge. Canopy cover c. 80%, herb cover also c. 80% (mainly Pilea sp. and Riedelia sp., some Cyrtandra sp.). Seedlings and saplings abundant; several individuals of a Pandanus sp. and one large tree fern (Cyathea sp.) present beneath the canopy. The soil drains freely, and the water level in a pit near the site is usually more than 1 m below the surface. Ridge Gap -- Altitude 2,480 m. About 10 m from Ridge Top site, completely flat. A large, partly decomposed trunk occupies the center; branch debris also present. Canopy cover c. 40% (around the edges of the site); in several places heaped growths of Nastus productus completely obscure the ground. Herb cover patchy, c. 25-40%; seedlings and saplings abundant in areas free of bamboo, and shrubs characteristic of gaps in the forest (e.g., Saurauia sp.) common. Valley -- Altitude 2,440 m. About 200 m from Ridge Top and Ridge Gap sites, on the bottom of a broad valley without a watercourse. One side rather open, with a canopy cover of c. 60% and few big trees; Saurauia sp. abundant, together with saplings and seedlings. The rest of the site has several large trees and a canopy cover of c. 80%; the ground vegetation is more open, with a sparse herb cover (30-40%) of Pilea spp. and Cyrtandra sp. The site, although in a valley, is well-drained and the soil is never waterlogged, but the water level in a soil pit nearby was frequently within 30 cm of the surface. Slope Site -- Altitude 2,430 m. About 100-m from Valley site, on a 46 degree slope with a small river 30 m below. Tree cover c. 80%, and rather little Nastus productus present. Herb cover c. 30%. Shrub layer c. 3-m high, distinct, composed of shrubs, saplings, numerous tree ferns, and a little bamboo. Several very old, highly decomposed logs present, covered by bryophytes and filmy ferns (Hymenophyllum spp.). The microtopography is step-like, and litter tends to accumulate in pockets on the less steep surfaces; the steeper surfaces remains bare or has a thin covering of bryophytes. Destructive Harvest Ridge Top -- Similar to nondestructive Ridge Top site described above, dominated by mature and late-building phase trees. The results from these study sites are given in this data set for the forest as a whole. Climate data in this data set are available from a weather station at the Marafunga sawmill, about 2.5 km from Marafunga study site, and from a clearing in the primary forest. The climate is characterized by seasonal rainfall (annual total of 3,635 mm MAP at the sawmill; 4,010 mm MAP cited in the literature from other sources) and cool temperature (8 - 18 degrees C). The heaviest rains fall are between October and April. During the period May to August there are generally several virtually rainless spells lasting 2-3 weeks during which time the forest appears to dry out, and the litter on the ridge-tops and slopes becomes crisp. An unusual and potentially important feature of the climate is the lack of cloud at ground-level (fog); none was seen during frequent and extended visits in the study period. This situation contrasts strongly with that in most montane rainforests. The only likely sources of long-term climate data are the stations at Goroka and Mount Wilhelm, but climate varies markedly across this mountainous region and such data may not be representative of the study site (Edwards, pers. comm.). Above-ground Biomass (Edwards and Grubb, 1977; Grubb and Edwards, 1985). Above-ground biomass was estimated on plots of 0.02-ha with a clear dominance of trees in the mature or late-building phases. Trees were considered mature if of mature height and considerable girth (100-200 cm, depending on species) but not apparently senescent, and to be in the late-building phase if similar but of lesser girth. The girth at breast height (gbh) was determined for all trees on 20 x 10-m plots at the Ridge Top, Ridge Gap, Valley, and Slope study sites, but no trees were felled. The biomass of all the other plant fractions was measured or estimated. Biomass was estimated on the basis of the regression obtained with destructive harvest data from a nearby plot (described below). The results were used to give a single estimate of the biomass of the forest at large. After the plot was cleared, roots and underground stumps to a depth of ~25 cm were extracted from two quadrats of 10 x 5-m. Roots were separated based on diameter: < 0.5 cm, 0.5-3.0 m, 3-6 cm, and > 6 cm. The fine roots were washed free of soil, and air dried before weighing. Biomass of dicotyledonous trees and pandans on the other study plots was estimated using a regression of biomass on diameter squared, based on the biomass results from Plot 1 (and four additional trees). See Edwards and Grubb (1977) for details and results. Leaf Area Index Edwards and Grubb (1977). Specific leaf areas (areas per unit dry weight) were determined for most of the important species of trees and climbers on Plot 1 (destructive harvest Ridge Top site), and for a few of the poles and saplings. In each case about thirty-five leaves were taken at random from the material collected, dried at 105 C, weighed, softened in a box with wet wadding, flattened and photocopied for determination of their area. When replicate samples of particular species were used, the values were mostly within 5% of the mean (at worst 9%). Litterfall (Edwards, 1977). Litterfall was collected at four 20 x 10-m sites (nondestructive Ridge Top, Ridge Gap, Valley, and Slope) using 1 x 1-m litter traps stratified on a random basis on each site (two traps within each of eight 5-m2 quadrats per site). Each trap was a square wooden frame held about 70 cm off the ground with polythene netting (5-mm diameter). The material from the litter traps was divided up as follows: (i) non-woody material (including leaves, flowers, fruits and detached epiphytes), and (ii) woody material (including bark, twigs and branches), subdivided further as (a) bark, and (b) twigs (0-0.5 cm; 0.5-1.0 cm; 1-2 cm; 2-3 cm; and >3 cm diameter). The results are expressed as g/m2/year by category, mean of the four sites. Additional studies were conducted to estimate apparent loss in weight of leaves before abscission (~10%) and loss to herbivory (~9.7%), but these data are not taken into account in the litterfall estimates. Leaf Decomposition (Edwards, 1977). Leaf decomposition was estimated in two ways: as the ratio of litterfall to standing crop of litter, mean of four sites, and experiments on litterfall disappearance using net bags placed on the forest floor. Litter on the Ground -- A metal baking ring 25 cm in diameter (area = 0.049-m2 ) was used for sampling. Sixteen squares 1 x 1-m were pegged out at each site (nondestructive Ridge Top, Ridge Gap, Valley, and Slope) on a stratified random plan. The ring was pressed onto the ground and all litter, including twigs < 1 cm diameter, was removed. Samples were collected on 26 November 26, 1970, March 20, 1971, and August 15, 1971. In the laboratory the litter was separated into the same fractions as the material from the litterfall traps, dried, and weighed. The annual litterfall amount (mean of four sites) was compared to total standing crop of litter on the ground (mean of four sites) to provide an estimate of decomposition constant (k). Litter Bag Decomposition -- During December 1970 falling litter was collected from near the nondestructive Ridge Top and Valley sites using two large 2.5-cm mesh nets. The leaves, or in the case of Dacrycarpus cinctus the leafy shoots, of seven species were removed from this litter and air-dried. The species selected provided a wide range of leaf size, shape and texture; six tree species (D. cinctus, Elaeocarpus ptilanthus, Litsea sp., Macaranga albescens, Planchonella firma, Schizomeria sp.) and the widespread bamboo (Nastus productus) were used. Twenty-four bags (plastic, springy mesh with ~8 mm openings when fully expanded, but usually more closed up) were made up for each species, and four further samples were kept for oven-dry weight determinations. On January 13, 1971 the bags were placed on the litter in the forest (1/2 at each site) and sampled after 131, 188, and 325 days. On these occasions four bags of each species were chosen at random from each site. The leaves were removed and dried at 105 degrees C before weighing. Decomposition constant (k) was estimated from weight loss after 325 days (mean of two sites). Bioelements and Mineral Cycling (Grubb and Edwards, 1982; Edwards and Grubb (1982). Bioelement concentrations were analyzed from nineteen organic fractions from Plot 1 (destructive harvest Ridge Top site): trees of gbh ~ 30 cm (trunk wood, trunk bark, branches, twigs, leaves), trees of gbh < 30 cm but > 4 m tall (stems, leaves), saplings and shrubs 1-4 m tall (stems, leaves), plants < 1 m tall (seedlings, climbers and scramblers, herbs), climbers and scramblers > 1 m tall (stems, leaves), epiphytes (stems, leaves), epiphytic soil, litter and dead trunks and branches. About 2,300 analyses were carried out using standard laboratory methods. Bioelement concentrations were analyzed from root samples removed from to a depth of about 25 cm on two sub-plots of 10 x 5-m on Plot 1: one with large trees and one without (cf. Edwards and Grubb, 1977). It was not practicable to separate the roots of different species; instead they were sampled by diameter classes: < 0.5 cm, 0.5-3 cm, 3-6 cm, > 6 cm. They were washed free of soil and for each diameter-class, six samples were analyzed, dried in a field oven at 80 degrees C, re-dried at 105degrees C in Cambridge, and ground to powder. They were then analyzed using the same methods as were applied to the above-ground vegetation and litter fractions of the forest. Climate. Climate data are available from January 1969 through June 1971. Rainfall for the period January 1969 - June 1971 was recorded daily by the staff of the Marafunga sawmill using a gauge on a post. Mean annual precipitation amount was extracted from published graphs. Records of maximum and minimum temperatures were made by Edwards (1973) for the period December 1970-August 1971 at litter level for four sites in the primary forest with readings taken every two weeks. A rainfall record for December 1970 - August 1971 was made in a large clearing in the primary forest by Edwards (1973) (but is not included in this data set). The records of rainfall at the sawmill compare favorably with those made in the forest clearing (Grubb and Stevens, 1985). This data set is available through the Oak Ridge National Laboratory (ORNL) Distributed Active Archive Center (DAAC). Alvarez-Sánchez, J. 1991. Productividad primaria neta en una selva tropical húmeda. Boletin de la Sociedad Botánica de México 51: 3-12. Clark, D. A., S. Brown, D. W. Kicklighter, J. Q. Chambers, J. R. Thomlinson, J. Ni, and E. A. Holland. 2001a. Net primary production in tropical forests: an evaluation and synthesis of existing field data. Ecological Applications, 11(2): 371-384. Edwards, P.J. 1977. Studies of mineral cycling in a montane rain forest in New Guinea. II. The production and disappearance of litter. Journal of Ecology 65: 971-992. Edwards, P.J., and P.J. Grubb. 1977. Studies of mineral cycling in a montane rain forest in New Guinea. I. The distribution of organic matter in the vegetation and soil. Journal of Ecology 65: 943-969. Edwards, P.J., and P.J. Grubb. 1982. Studies of mineral cycling in a montane rain forest in New Guinea. IV. Soil characteristics and the division of mineral elements between the vegetation and soil. Journal of Ecology 70: 649-666. Grubb, P.J., and P.J. Edwards. 1982. Studies of mineral cycling in a montane rain forest in New Guinea. III. The distribution of mineral elements in the above-ground material. Journal of Ecology 70: 623-648. Grubb, P.J., and P.F. Stevens. 1985. The Forests of the Fatima Basin and Mt. Kerigomna, Papua New Guinea with a Review of Montane and Subalpine Rainforests in Papuasia. The Australian National University, Camberra. pp. 221. Olson, R.J., K.R. Johnson, D.L. Zheng, and J.M.O. Scurlock. 2001. Global and Regional Ecosystem Modeling: Databases of Model Drivers and Validation Measurements. ORNL Technical Memorandum TM-2001/196. Oak Ridge National Laboratory, Oak Ridge, Tennessee, U.S.A.